Companies of all sizes are being challenged to scale their business models while simultaneously keeping operations running responsively and efficiently. Because of this, cloud-based analytics platforms are beginning to close the gap between the offerings of legacy systems and what modern enterprises need in order to compete and grow. The goal of this article is to provide insights into the top trends most influencing cloud analytics selection decisions today and to present some of the best cloud analytics vendors have to offer. So let’s get started! Cloud BI tools capable of being implemented using agile methodology will continue to attain results the fastest. Cloud platforms that are capable of being implemented incrementally while taking into account internal and external stakeholder requirements (such as those from customers, IT, marketing, sales, service and senior management) get the best results. Agile development methodologies dominate enterprise software development today. Forward-thinking cloud platform vendors are giving their customers the flexibility of taking an agile based approach to implementing their analytics platforms as well. The majority of enterprises acquiring cloud analytics platform solutions are opting for short-term contracts with 12 to 24 months being most common. The factors driving short-term commitments for cloud platforms include budgeting and spending constraints within business units, the opportunity to negotiate better pricing at renewal, and greater influence on product and service roadmaps in the short-term. Given how fast new algorithms, apps and platform extensions are happening today, shorter contracts are freeing up enterprises to get out in front of the innovation curve and make it work to their advantage. The algorithm economy has arrived, and competitors are moving fast to reorder industries using cloud platforms as the catalyst to deliver greater insights corporate-wide. The advanced analytics capabilities being developed and tested today will change the competitive landscape of manufacturing and service industries within the next three years or less, according to Louis Columbus. Leading companies, including AstraZeneca, Ingram, General Electric, FedEx, UPS and others, are all defining business models today based on algorithms that deliver insights and intelligence not possible before. Cloud based analytics platforms including IBM, Microsoft, SAS, Salesforce and others are supporting advanced algorithms capable of supporting entirely new business models. The need for data scientists with algorithm expertise is skyrocketing as a result. Users should benchmark cloud analytics platforms on how quickly they are adding advanced prescriptive and cognitive analytics apps to the workflow level. The challenge for analytics platforms providers is the majority of work being done today is reactive, or at best, anticipating future events. Analytics vendors pushing forward with a greater focus on prescriptive and cognitive-based analytics apps are ahead of the market. They realize that machine learning and advanced algorithms will be the new normal in three years or less and are planning for that today. Look to scale beyond descriptive and predictive analytics apps by finding analytics platform providers capable of propelling your company to the upper levels of the Intelligent Cloud Maturity Model. The majority of companies today are locked in the lower layers of the Intelligent Cloud Maturity Model, as shown in the graphic below. Using analytics apps that only deliver descriptive analytics is like trying to drive forward by staring in the rearview mirror. Enterprises need to push analytics platform providers to develop and launch machine learning, advanced prescriptive analytics and cognitive analytics. When this happens, companies will be able to see how the timing of a decision during a given financial period makes a major difference in outcomes. Best of all, there will be less guessing and more knowing why a given strategy or business model is succeeding or not. By using the Intelligent Cloud Maturity Model as one of many frameworks to evaluate analytics platform providers, companies can make the best possible decision when it comes to the analytics platform they choose. The innovations happening in data discovery will transform cloud BI tools quickly, integrating search and visual-based data discovery with automated data preparation and natural language support. Imagine being able to have Tableau running on top of a cloud analytics platform that capitalizes on the latent semantic index (LSI) algorithms used for capturing insights from unstructured data. Use cases like this and others are in development today. Data discovery will be significantly different on these platforms in the next three years as a result. 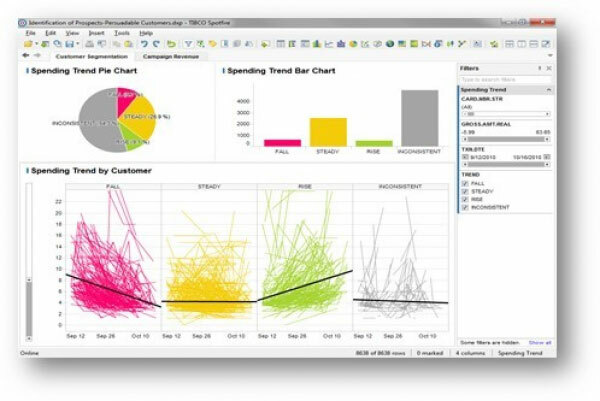 This Qlik product offers end-to-end data analytics capabilities. Its associative engine feature indexes all possible data relationships and renders insights instantly. Unlike query-based BI systems, Qlik Sense is not restricted to pre-aggregated data or predefined queries, giving users immense freedom to perform needed data analysis. Want that data immediately? Qlik Sense offers real-time analytics and options for collaboration in addition to exploration. Data storytelling and an object library allow the system to create advanced, intuitive visualizations of data. Data associations and trends are displayed in color-coded schemes for quick interpretation: green for selected, white for associated and grey for unrelated. This contextualization helps users discover hidden insights that tools relying on queries might miss. Qlik Sense’s self-service data preparation and exploration make data analysis accessible for non-technical users. Users can drag-and-drop data sources and get suggestions to identify the best associations. Then the system can automatically process datasets and provide descriptive analytics through derived fields, binning, concatenation, etc. This cloud analytics platform solution will grow with you: it is built on a multi-cloud governed architecture that scales and deploys analytics while maintaining compliance requirements. Its central management point at Qlik Management Console lets users define security rules to ensure data safety. Board’s platform combines BI, enterprise performance management, data discovery and both predictive and business analytics. This unified solution offers a huge range of capabilities like dashboards, visualizations, scorecards, budgeting, reporting, forecasting, planning, profitability analysis, simulations, machine learning, statistical functions, etc. This system takes a programming-free approach to make it accessible to the least tech-savvy employee in your organization. Its integrated toolset provides an interactive environment that lets users build Board capsules, modules that can store spreadsheets, graphs, reports, maps, folders and navigation menus. It can also change data models during the planning or forecasting step without altering the seamless experience, offering spontaneous forecasting capabilities. Board’s in-memory tech, known as Hybrid Bitwise Memory Pattern (HBMP), offers read and write capabilities, impressive speed to visualization and all-in-one performance. Its in-memory server cluster architecture allows users to access Board server workloads on a nearly endless number of nodes, ensuring horizontal scalability. This business analytics platform lets users engage with relational, semi-structured and raw data sources through a comprehensive system of in-memory and direct-query data connectors. 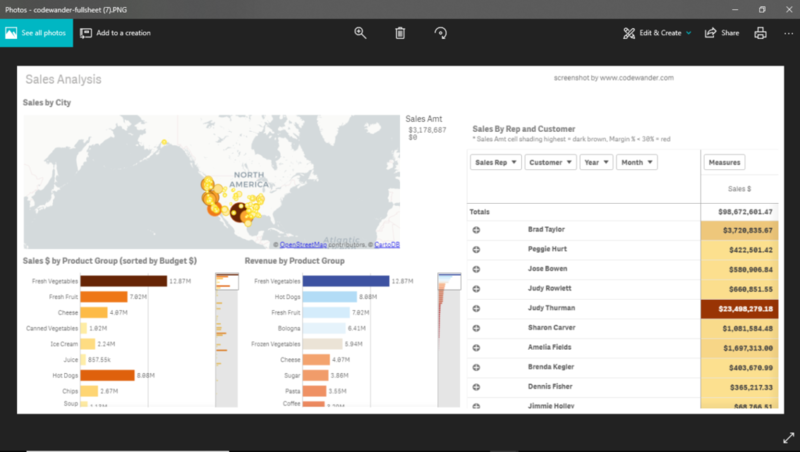 Whether this data is stored on the computer, in big data sources like Hadoop, in a relational database or in a multidimensional database, Tableau can connect you. Tableau offers built-in geographic capabilities that let users analyze data by plotting it geographically on a map.  Its natural language interaction function allows users to perform queries using natural language rather than code and get an instant response in a visual format via the Show Me feature. This starts with a palette of available visualization options, then narrows the selection and highlights suggested approach based on the data you are analyzing. The built-in time and date functions let users drag and drop in order to analyze trends, drill down with a single click, analyze data organized by time or day and perform a range of time-based comparisons. Its intuitive user interface and visual query language, known as VizQL, translate these drag and drop motions into data queries. IBM’s AI-powered business cloud analytics tool offers self-service capabilities to help users draw insights from data and make better-informed decisions. Its data preparation function offers built-in system recommendations that clean, shape and blend data from multiple sources. Cognos is an integrated solution for data discovery and reporting that reveals patterns as well as insights into data relationships. Cognos offers an embedded geospatial mapping feature that contextualizes data by location. It guides users through data exploration with natural language-based virtual AI to make the data discovery process as accessible as possible. Users can create dashboards with a drag-and-drop interface. Once users have begun the data discovery process, Cognos’ AI can recommend the best form of visualization for the given data based on different templates and styles. It offers statistical highlights from each visualization through natural language dialogue and relates associated visualizations to prompt the user to explore deeper. This enterprise solution blends augmented, automated, agile and real-time analytics to offer users quick insights from their proprietary data. It can connect, clean and blend data from a variety of sources. Then, Spotfire continuously indexes the source and recommends related data to be added to the analysis. TIBCO supports interaction with data via natural language queries, and its dimension-free data exploration lets users interact intuitively without constraints. Spotfire X offers data drill-down into micro levels for root cause analysis, and users can mash up or swap data sets to explore freely. Spotfire’s self-service data preparation offers data wrangling features that clean and enrich data while simultaneously analyzing it. Then the platform applies text-mining algorithms to automatically discover and infer hidden relationships among non-numerical data like tables, documents, concepts, etc. Through a combination of machine learning, natural language search and automation, Spotfire performs augmented analytics on your data. It also has a native R engine that can run open-source statistical language queries inside any analysis. This R code can be used in predictive analysis, modeling, clustering, forecasting, etc. The bottom line is that the scale, speed of deployment, agility and ability to rapidly prototype analytics workflows on cloud based analytics platforms is winning out over more costly and time-consuming alternatives that require IT’s time and attention. 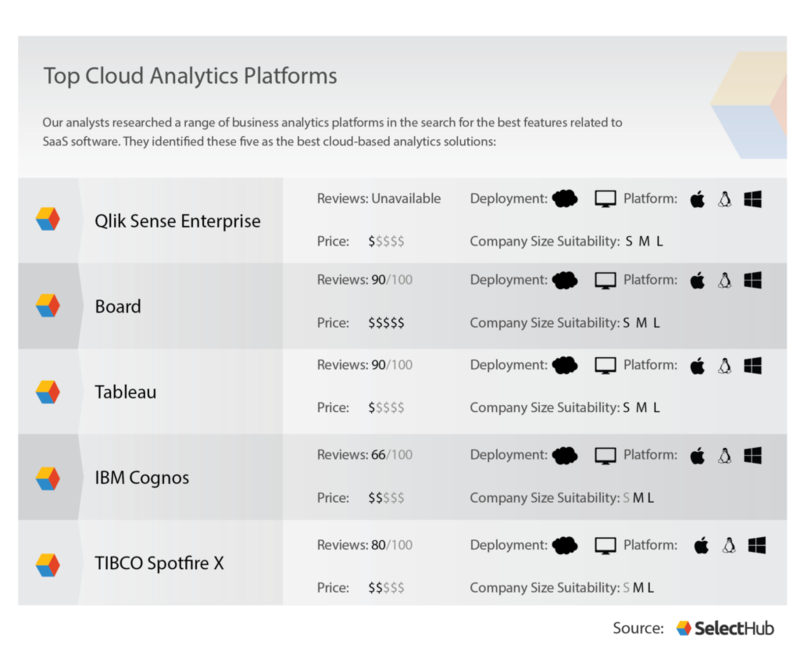 Different cloud analytics companies offer different pros and cons with each solution, and these systems may not be the best for your organization — that’s why we recommend completing a comprehensive search based on your unique requirements. Then you can compare platform features and pricing based on what you need, rather than what the industry thinks you want. Do you agree with our analysts’ picks? 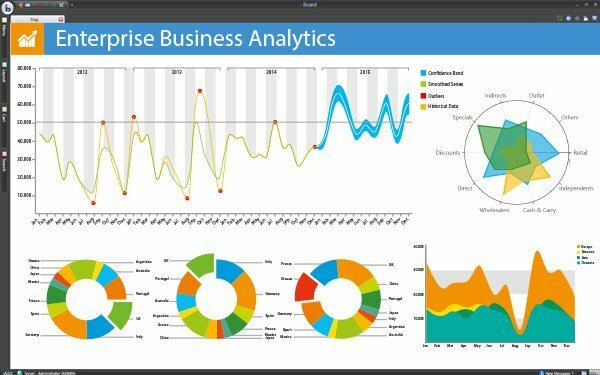 What cloud analytics platform do you use? Let us know in the comments!